Dr. Alvandi has been designing and creating beautiful smiles in Houston for 20 years. She is committed to excellence in dentistry and long term care of all of her patients and their families. She loves being a part of the community in Houston and Katy and always looks forward to helping her patients achieve their dental goals. Dr. Alvandi received her Doctorate of Dental Surgery from the University of Texas Dental Branch in Houston and certification in Implantology from the University of Texas Health Science Center in San Antonio. She is also Invisalign certified and works with her patients in meeting comprehensive dental health goals by offering all phases of dentistry. 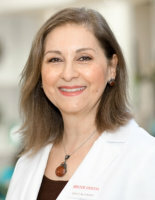 Dr. Alvandi is the mother to both Dr. Sara Ekhlassi and Dr. Sanaz Ekhlassi. In her spare time, she enjoys sewing, working out, traveling, and cooking for the family. Dr. Ekhlassi has been living in Houston since she was three years old and has a great appreciation for the Lone Star State. She attended the University of Texas at Austin, where she majored in Biology. She then went on to the University of Texas Dental Branch in Houston to receive her Doctorate of Dental Surgery. Following dental school, she was accepted to complete a General Practice Residency at Montefiore Medical Center in the Bronx, New York. In her residency, she treated medically complex patients in hospital and clinical settings which allowed her to expand her knowledge of dental medicine and treatment of patients with advanced needs. Dr. Ekhlassi then began practicing dentistry in three of the five boroughs of New York City. In 2011, she decided to return to her hometown in Texas to work side by side with her mother, Dr. Alvandi, and her sister, Dr. Sara Ekhlassi. She continually feels blessed to be able to work in a family practice where there is great communication between doctors and provides the opportunity for excellent continuity of treatment for her patients. In her free time, Dr. Sanaz Ekhlassi loves sewing, painting, ice skating, live music, spending time with friends and family, and working out. While in dental school, Dr. Ekhlassi researched efficacy of local anesthesia in patients during dental procedures; and also cytokine activity in gingival cells in order to better understand those underlying mechanisms for periodontal disease. Dr. Ekhlassi is a specialist in orthodontics and is dedicated to making beautiful, lasting smiles for all of her patients! She has been a Houston resident for the majority of her life, graduating from Cypress Creek High School. She then attended the University of Texas at Austin where she received her Bachelor of Arts. 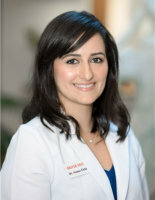 After college, Dr. Ekhlassi attained her Doctorate of Dental Surgery degree from the University of Texas Dental Branch in Houston; where she went on to complete a General Practice Residency at Memorial Hermann Hospital. 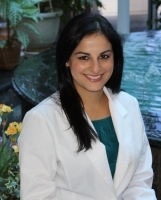 While attaining her dental education, Dr. Ekhlassi fell in love with the specialty of orthodontics! She continued her education by being accepted into an orthodontic residency program at the University of Texas Dental Branch at Houston, where she received a Specialty Certification in Orthodontics and a Masters of Science in Dentistry. Dr. Ekhlassi is a board certified orthodontist and an active member of the American Association of Orthodontists, American Dental Association, and the Texas Dental Association. While in orthodontic residency, Dr. Ekhlassi married her best friend, Alex, and they began their new life together. Besides spending time with her husband and family, her interests include photography, working out, travelling, and decorating their home. Although every patient and every treatment is unique, Dr. Ekhlassi strives to provide the best orthodontic treatment possible for all her patients. She understands the importance of a beautiful smile and will work hard to create one that is just right for you! After all, a smile is worth a thousand words!